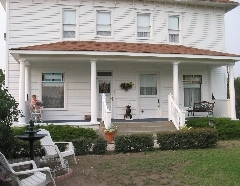 Buffalo Bill Cody’s House Bed and Breakfast is located 2 1/2 miles from downtown Cody, 1 mile from the entrance to the South Fork Highway. The home was built in 1902 for Buffalo Bill and was located behind the Irma Hotel. The historic home was moved to its present location in 1972. Choose from three themed bedrooms and enjoy a full breakfast with all the “trimmins”! Relax on the front porch in the evening and watch for shooting stars. The bed and breakfast is for adults only, no pets and no smoking. All the guest rooms are located upstairs in the home. The proprietors serve a hearty western breakfast from 7-9 am. Special requests can be made at reservation time. Open June-September.